Here's a great new online slots game from 1x2 Gaming that you can be playing. No one dares to anger the Gods. They are immortal and higher beings who control the forces of nature, the universe and human endeavours. The twelve Olympians rule everything under the sun and answer to Zeus alone. Strive to please them and if you dare not, you’ll end up banished to Hades’ Underworld. 1x2 Gaming is known for their simple approach to games. They don’t like to make their games too complex, so that each and every gambler can have an opportunity to sample their creations. They don’t usually have highly innovative games. Instead, their focus is usually virtual sport betting games that promise instant rewards. If you’re looking for slot games to start off with in your world of gambling then theirs are a good choice. The developers really banked big on the aesthetics here. The first thing that gets you in the opening sequence is the ancient field animation with mountains in the horizon. You can see the pillars in ruins- signs of early Greece. Some of the pillars look broken while others lie on the grass. In the background you can start to hear the game’s soundtrack. Once you get into the gameplay, the slot is set against the same background as was in the opening sequence. The backdrop is now a blue looking silhouette, the pillars making up the frame don’t look as good as they previously did. There’s nothing too exciting going on in the graphics department here. Even the symbols look just okay. The wild symbol- The wild symbol is a Greek goddess. The goddess substitutes for any other symbol except scatters. 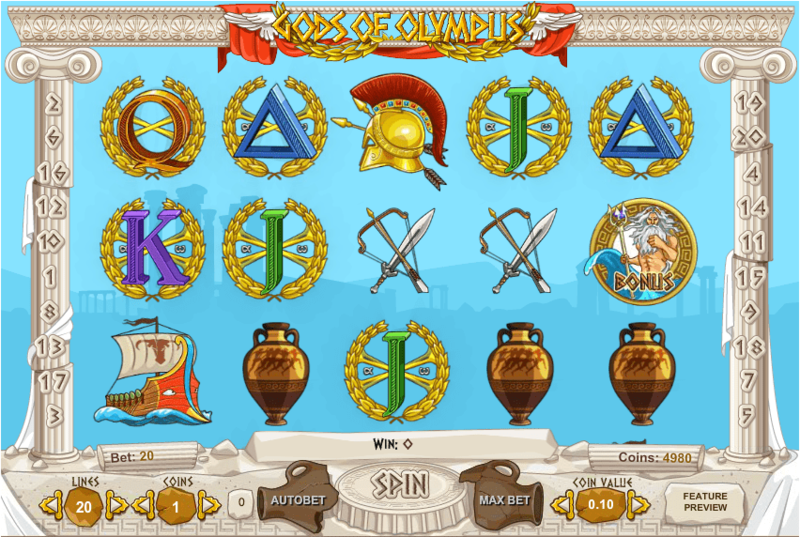 Scatters- Landing Zeus 3 times or more on one of your win lines will trigger free spins. If you land Poseidon, you trigger the bonus round. Zeus has to come with his lightning in hand and Poseidon with her fork in hand. Free spins- Zeus gets you 10 free spins which is considered a standard free spin round and multiplies rewards by 2x. When the free spin round begins, the backdrop gets dark and the background music that played during the opening sequence starts. Bonus round- Here you’re presented with 5 urns. Click on all of them hoping to find a cash prize in the form of gold coins. If you open an urn and a puff of smoke comes out, it is worthless. Amounts won vary from urn to urn, with some having more gold cons than others. There’s nothing particularly attention grabbing from this game. The graphics are basic, there’s more they could have done with the theme and gods and the rewards are pretty standard. It’s not the kind of slot game that will have you fired up to play it, but it’s good for beginner gamblers. The only highlight would be the regular wins. If you don’t like to spend too much time on playing features, give this one a go.